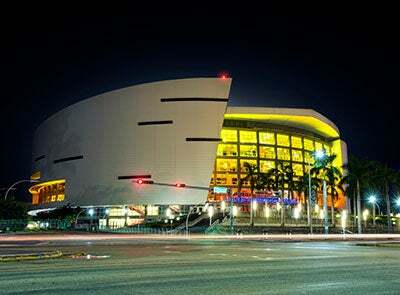 MIAMI – AmericanAirlines Arena, home of the three-time NBA Champion Miami HEAT, has claimed the #6 spot in the United States while maintaining its position as the #1 arena in Florida for the third consecutive year—and the sixth time during the past seven years—according to Pollstar’s 2017 year-end rankings of the world’s top arenas. Internationally, the facility placed 18th in the world. AmericanAirlines Arena earned its lead ranking by selling 625,983 tickets for the 2017 calendar year for a variety of concerts, family shows and other special events. Last year, AmericanAirlines Arena proudly hosted megastars such as Lady Gaga, Bruno Mars, Paul McCartney, Red Hot Chili Peppers, Carlos Vives, Radiohead, Ariana Grande, John Legend, Ed Sheeran, Depeche Mode, Enrique Iglesias, Pitbull, Mumford & Sons, Marc Anthony, Jay-Z, Katy Perry, J Balvin, Hall and Oates, Chris Brown, Ricardo Arjona and Andrea Bocelli, among others. The Arena also welcomed recurring events including the iHeartRadio Fiesta Latina, Telemundo’s Premios Tu Mundo and the HoopHall Miami Invitational to name a few. In addition, AmericanAirlines Arena is home to family shows such as the Harlem Globetrotters, Cirque du Soleil, WWE, and Disney on Ice. Pollstar is an entertainment publication for professionals in the concert industry and is the only publication that covers the business worldwide. Pollstar collects box office reports from almost all of the world’s top-level artists, promoters and venues. Pollstar’s rankings include all figures for tickets sold worldwide as reported to Pollstar on a quarterly basis.